How can a contemporary long poem by a Western writer be transformed into a drama for one of theater's oldest forms, Japanese noh? "Fisherman, 1973" was taken by Robert Minden as part of a series of photographs of the Japanese-Canadian fishing community in Steveston. The photographs were paired with poems by Daphne Marlatt in the 1974 book "Steveston," which has been hailed as a Canadian classic. That was the challenge that Heidi Specht, the artistic director of Panagea Arts, a multicultural theater company in Vancouver, presented to Tokyo-based composer Richard Emmert last year. Specht proposed that Emmert collaborate with Canadian poet Daphne Marlatt on an English-language noh play about the Japanese-Canadian fishing community of Steveston, the subject of Marlatt's acclaimed 1974 poem-series of the same name. "Other writers have sent me noh plays which have some connection to Japan -- I think they feel that if it is a noh play, it has to have a Japan connection," said Emmert. "Personally, I don't feel that at all." What impressed him about "Steveston" was Marlatt's powerful evocation of place. The poet, who will be giving a lecture and readings from "Steveston" in Nagoya next week, will be in Japan for two weeks to work with Emmert on the project. The two met for the first time last year when Emmert, who heads up Theatre Nohgaku, a group comprised mainly of Americans based in Japan and the United States that creates and performs noh plays in English, gave a weeklong noh workshop in Vancouver. Marlatt, who has been interested in noh ever since she took a course in Japanese literature in translation at the University of British Columbia in the 1960s, participated in the workshop and found Emmert a fine teacher. "I learned a lot from having to memorize dance steps and chanting and drumming patterns," she recalls. The experience proved valuable when Marlatt worked at transforming into a noh play the 21 poems that comprise "Steveston," and when the two discussed a possible collaboration, Emmert was impressed by the poet's sense of the dramatic shape of noh verse. "She showed me several paragraphs of an outline of a play, but it already had a clear noh-like structure. I have worked with several other playwrights and have gone over possible noh structures, but they still often come up with more of a Western-like dialogue play rather than the makings of a poetic song play with a believable, nohlike structure." The purpose of Marlatt's current trip to Japan is to give her an even clearer feel for the shodan, the musical passages that form a noh play, as she continues to build the text. This is not the first time that Marlatt has been involved in a collaborative project. In fact, "Steveston" itself was a collaboration between the poet and photographer Robert Minden. The poem had its beginnings in interviews conducted with Japanese-Canadian residents of Steveston, which were being collected as aural histories for the Provincial Archives of British Columbia. As in the United States following the bombing of Pearl Harbor in 1941, the Canadian government designated Japanese-Canadians as "enemy aliens" and forced them from their homes, confining them to camps in the country's interior. But that first encounter with Steveston drew Marlatt in, and she continued to delve into the history and folklore of the community. 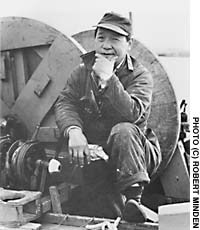 The noh play now in development -- titled "The Gull" -- is set on a gillnetter anchored up the coast during 1949, the first year that Japanese-Canadian fishermen were allowed back to fish. "It began with the nub of a ghost story that one of the Steveston fishermen told me in the early '70s," said Marlatt. With the help of Specht of Pangea Arts, Marlatt has explored the local coastal history, and talked to fishermen who remember what the fishing grounds and anchorages were then. "Noh is highly symbolic, but I feel the need to get the prosaic aspects of fishing firmly in my mind before I can resolve them into the symbolic," said Marlatt. "Noh is also highly intertextual, but I'm weaving in excerpts not so much from classical sources, but from the poetry of contemporary Japanese-Canadian poets such as Joy Kogawa," she said. For Marlatt, the progression from poetry to noh is a natural one. "Though noh is very different from Western notions of what is 'dramatic,' the emotional and spiritual drama of a noh play touches an audience on a deep level, as poetry does." "The Gull" will be staged in Vancouver, performed by Canadian actors, dancers and musicians. However, plans are afoot to bring it to Japan -- perhaps to Wakayama City, which is a sister city of Richmond, the community that has grown up around Steveston. The migration of "The Gull" -- East meets West Coast -- will be an event to follow. Daphne Marlatt will read from "Steveston" and other works and talk about her writing in Room EF in the 12F Artspace of the Aichi Arts Center in Nagoya (Higashiyama Line, Sakae Station, Exit 4), April 27, 6:30-8:30 p.m. Admission is free, but please call (052) 805-5092 to reserve a seat.